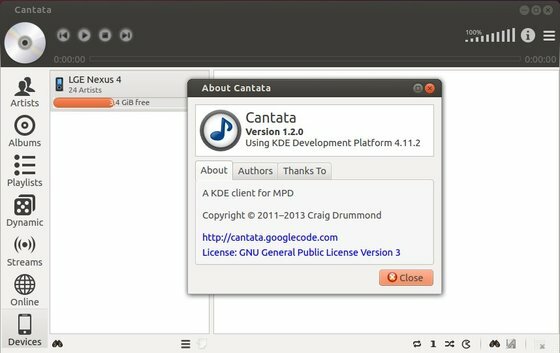 Cantata is yet another MPD client. This tutorial shows how to install the latest Cantata via PPA in Ubuntu 14.04, Ubuntu 13.10, Ubuntu 13.04, Linux Mint and their derivatives. Library – sorted as Album Artist (or Artist if Album Artist not set), Album, and finally Track. Albums – displays albums as icons, sorted by their title. 1. I found that it does not reconnect after suspend, which seems like a bug to me. You have to restart it to force the connection. 2. Furthermore it would be great to add a volume control like in sonata, i.e. mouseover the unity icon and use the scrollwheel. Otherwise its a great program and integrates far better into unity than the alternatives. It is flashy and superfast. Maybe it would be great if you could get it into the official repos, too.